Archives : DEEPAWALI SPECIAL - NIFTY HEADED TOWARDS 7355 - 30/10/2013. DEEPAWALI SPECIAL. NIFTY HEADED TOWARDS 7355 - 30/10/2013. After a long wait of more than 5 years, finally the market is on the verge of knocking off life time high levels which stands at 21308 and Nifty 6357. Both Sensex and Nifty were in correction mode for more than 2 years now, which finally seems to have ended this year. Hopefully now we are ready for the next move forward for a minimum target of Sensex 24434 and Nifty 7355, provided Sensex stays above 18827 and Nifty above 5648. The journey upwards will definitely be challenging for the bulls but more importantly the upwards journey seems to have begun at last. 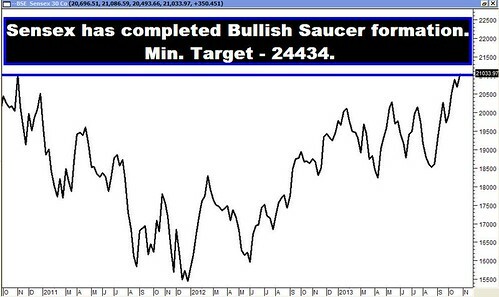 Sensex has completed a Bullish Saucer formation starting from November 2010 to October 2013, even as the Nifty is on the verge of completing this Bullish Pattern. The depth of the saucer for the Sensex is 5550 and for the Nifty is 1688. The target thus works out to be atleast 24434 for the Sensex and 7355 for the Nifty and on the higher side Sensex 26554 and Nifty 8000. The target is likely to be achieved in the next 18 months. On a cautionary note, the bulls need to maintain and stay above Sensex 18519 and Nifty 5471 for the long term Uptrend to continue. In case the above levels are breached, then the long trend will be reversed and then the Sensex will move lower to the support zone around 15135 and Nifty 4531. For the year ahead, Sensex will face Resistance at 22823-24763-26554 and Support will be at 19131-17250-15135. For the Year ahead, Nifty will face Resistance at 6818-7355-8000 and Support will be at 5700-5118-4531. 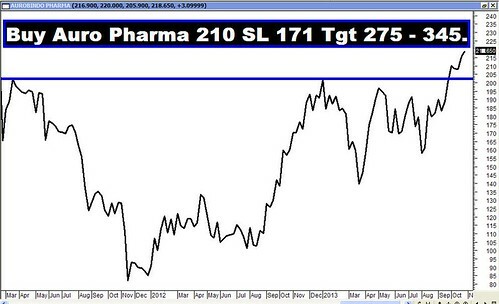 SENSEX @ ALL TIME HIGHS – 01/11/2013. Finally it has happened; Sensex has registered an all time high on Friday, surpassing the previous all time high of 21206 after a period of around five years. Nifty too has closed at all time high levels but yet not surpassed the levels of 6357. It seems the Bulls have chosen the Deepawali day to break this level. For the week ahead, Sensex will find Support at 20917-20664-20375 and will find Resistance at 21523-21873-22214. For the week ahead, Nifty will find Support at 6220-6127-6032 and will find Resistance at 6392-6487-6584. The Star Performers of the week were Union Bank and Bank of Baroda which went up by 14% and 13% respectively!! !